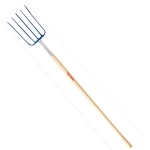 The True Temper manure fork is used to transport manure, mulch, and other loose materials. It can also be used to clear and replace mulch around plants. The 5-tine head is forged from one solid piece of steel for years of service.